Republicans and Democrats have strong negative reactions to the opposing party. Feelings of frustration are most common – 58% of Democrats and 57% of Republicans feel frustrated by the other party. But large shares also react with fear and anger toward the other party. A majority of Democrats (55%) say the GOP makes them feel afraid, while 49% of Republicans say the same about the Democratic Party. And nearly half of Democrats (47%) and Republicans (46%) say the other party makes them feel angry. Overwhelming majorities in both parties (87% in each) have at least one of these negative feelings about the other party – frustration, fear or anger. When thinking about their own parties, substantial majorities of both Democrats (73%) and Republicans (64%) say their parties make them feel hopeful. But far fewer say their own parties stir feelings of enthusiasm or pride. Only about a quarter of Democrats (26%) and a similar share of Republicans (23%) say their party makes them feel enthusiastic. Roughly a quarter of Democrats (26%) also say their party makes them feel proud, while fewer Republicans (16%) say the same about their party. Republicans are more likely to say that their party engenders frustration than say it makes them feel enthusiastic or proud. 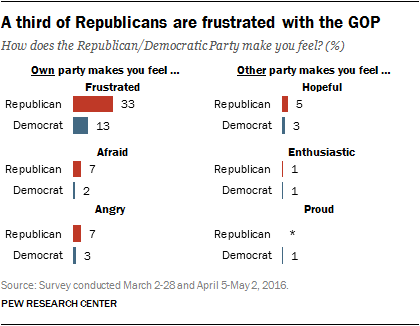 A third of Republicans (33%) say the GOP makes them feel frustrated. By comparison, just 13% of Democrats express frustration with their party. 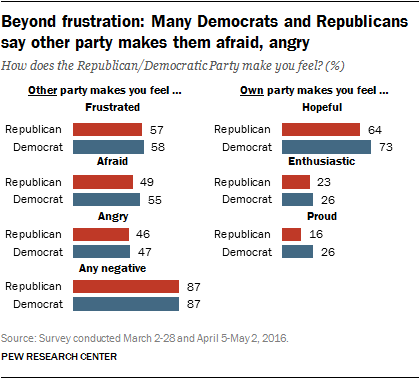 Very few partisans feel afraid or angry toward their own party. And only tiny shares in each party say the other party makes them feel hopeful, enthusiastic or proud. Those who are more politically active are significantly more likely to be express negative emotions about the other party – particularly to say that it makes them feel afraid or angry. Among highly politically engaged Republicans – those who say they vote regularly and have volunteered for or donated to a political campaign in the past year – 62% say that the Democratic Party makes them feel afraid. Among those moderately engaged (those who vote regularly, but do not participate in or donate to campaigns) 51% are afraid. And among the least engaged Republicans (irregular voters or those not registered to vote), just 37% say they are afraid of the Democratic Party. The pattern is similar among Democrats. Fully 70% of highly engaged Democrats say they are afraid of the Republican Party, compared with 46% of Democrats who do not vote regularly or are not registered. Similarly, political engagement is associated with anger at the other party: 58% of both Democrats and Republicans who are highly politically engaged are angered by the other party; fewer than half of those who are less engaged say the same. 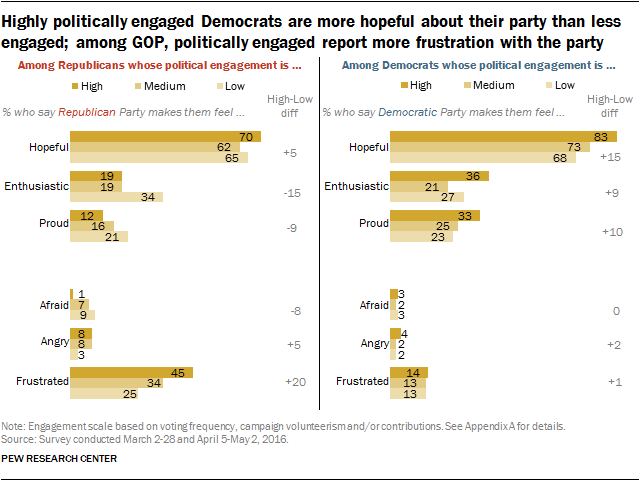 On the other hand, frustration with the other party is not associated with political engagement: About six-in-ten of those in both parties, regardless of how actively they participate in politics, say they feel frustrated with the other party. Among Democrats, those with higher levels of political engagement are more likely than those who are less engaged to express positive emotions about their party. But among Republicans the differences in positive feelings are far more modest. And Republicans who are more engaged are less enthusiastic about the party – and more frustrated – than are those who are less active. Highly engaged Democrats say their party makes them feel hopeful (83%) at higher rates than less engaged Democrats. And while feelings of enthusiasm and pride are not widely felt emotions, those who are the most politically active are more likely to express both emotions about the Democratic Party. Highly engaged Democrats are no more likely than less engaged Democrats to express frustration with their own party (14% vs. 13%). Among Republicans, the GOP inspires feelings of hope among similar shares of the highly engaged as well as the least engaged (70% vs. 65%). But about a third of the least engaged Republicans (34%) feel enthusiastic about the GOP, compared with 19% of those who are more politically engaged. Relatively few Republicans overall (16%) feel proud of the GOP, and there is no significant difference by levels of political engagement. Highly engaged Republicans are, however, more likely than those who are less engaged to express frustration with the GOP: Fully 45% of highly engaged Republicans say this, compared with a quarter (25%) of the least engaged Republicans. Republican registered voters who supported Donald Trump in the GOP primary are more likely than those who supported other candidates to say that the Democratic Party makes them feel angry (58% vs. 44%). But Republican voters who supported Trump in the primaries are no more likely than those who did not back Trump to say that they feel frustrated with or afraid of the Democratic Party. On the Democratic side, voters who supported Hillary Clinton and Bernie Sanders in the primaries are about as likely to say that the Republican Party makes them feel frustrated (59% and 64%, respectively). But Sanders backers are more likely than those who preferred Clinton to say that they the Republican Party makes them feel afraid (68% vs. 55%), and to say that the GOP makes them feel angry (57% vs. 46%). Republican voters who backed Trump in the primaries are more hopeful, enthusiastic and proud of the Republican Party than those who did not support him in the primaries. For example, 75% of those who supported Trump say the party makes them feel hopeful, compared with 59% of Republicans who supported another candidate. On the other hand, Democratic supporters of Clinton and Sanders are about equally hopeful or enthusiastic about the Democratic Party, while those who backed Clinton are more likely than Sanders supporters to say that the party makes them proud (32% vs. 21%). Like partisans, independents who lean to the Republican or Democratic Party feel negatively toward the opposition. Eight-in-ten Republican-leaning independents (80%) have at least one negative reaction to the Democratic Party (frustration, anger or fear) as do 87% of those who identify as Republicans. Among Democratic leaners, 75% express at least one of these emotions about the GOP, compared with 87% of Democrats. Democratic leaners are far more likely than Democrats to be frustrated with the Democratic Party. More than a third of Democratic-leaning independents (36%) say they are frustrated with the Democratic Party, compared with just 13% of those who affiliate with the party. Among Republicans and Republican leaners, there are smaller differences in the shares saying they are frustrated with the Republican Party (33% of partisans vs. 40% of leaners). Both Democrats and Republicans feel more positively toward their parties than do leaners. For instance, 64% of Republicans say their party makes them feel hopeful, compared with just 38% of Republican leaners. And while 73% of Democrats feel hopeful about the Democratic Party, about half (52%) of Democratic leaners say the same.